Evenings are the witching "hour" for our girls. If you've never heard of the witching hour, ask parents of young babies. At some point around 7pm-ish, Teagan and Quinn both decide to test our patience by bringing out their fussiest behaviour. It usually happens around the time we're trying to quickly prepare and eat dinner. This results in one or both of us walking and bouncing a baby while our dinner sits on the table getting cold. Enter the Baby K'Tan. This wrap can be put on with a baby tucked into it in a matter of seconds. Tonight, with two fussing babies and a kitchen that needed to be cleaned up, I decided to try carrying both of them. Yes, they're a little on the heavy side, but I'm not going to complain for a minute. The silence is golden and Jenn was able to clean up the kitchen in her usual record time! 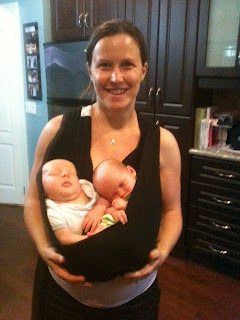 Just clicked through from another blog and thought I would say hello and Congrats on your beautiful baby girls! I have two-year-old twin girls, and I can SO relate to your recent posts about feeding, shushing, witching hour, etc. Just making it through the day is an achievement for the first couple of months, but as I'm sure you've heard, it gets so much better. Enjoy your sweet babies!! The Giant Puppy and His "Puppies"
Parenthood - Where to Begin? !